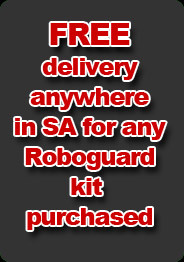 240 000 Roboguards have ALREADY been Sold in South Africa! 98% By word of mouth! We know that people who have Roboguards, share their positive experience without any compensation, and we thank them...but that has changed! There are still many people in South Africa who do not know about Roboguard! With your help that will change, and we will be very happy to pay you for your efforts. Customers spend between R5000 and R25000 on Roboguard Solutions and we will pay you 5% commission, as a big thank you for mentioning us! If your referrals decide to take our affordable rent2buy option, we will pay you R500 per contract. So if you have 250 friends, emails, family members or associates, and 15 people buy Roboguards cash from us and 7 people take the rent to buy option; you could earn up to R11 483!! When you become a valued Roboguard customer, you will automatically be allocated a unique Roboguard web-site URL which will track visitors and sales to our web-site from you! (all their sales current and future) If they buy or rent, you will automatically be Paid for the referral! All you have to do is tell friends and family about your experience with us, through facebook, whatsapp, email etc and we will do the rest! You will be able to log in at anytime to see who of your referrals have bought or rented, cash in your money or claim against your own system or upgrade..you choose!